For some time now the link between ‘overpronation’ and overuse injury has been known to be tenuous, but the most recent evidence does suggest that there is a small, but statistically significant risk for injury (but then that depends on how you want to spin that evidence and actually define what ‘overpronation’ even is, but lets not go that way for now). Despite this, the concept of ‘overpronation’ (or lack of it) has been and unfortunately probably still is the prevailing paradigm for the marketing and prescription of running shoes. Also, despite that tenuous link to injury, if you try and do something about the overpronation with things like foot orthotics, the evidence is clear that people do get better. This apparent paradox has led to the investigation of some other foot and lower limb biomechanical parameters to try and explain or work out what is going on to solve that paradox. One of these is what has become know as ‘supination resistance‘; a term that was first used by Kevin Kirby in 1992 and again in a newsletter in 1997, so there is nothing really new in this. I have been banging on about it for well over a decade now about its probable importance. What underpins it is the assumption that motion (eg ‘overpronation’) is not painful and does not damage tissues. What damages tissues are forces or the loads on the tissues, so maybe a solution to the apparent paradox is not to look at things like overpronation (a motion), but to look at the forces that are stopping the motion, regardless if the foot is overpronated or not. It is those forces that are likely to damage the tissues, so supination resistance is a clinical measure of the force needed to supinate the foot (ie stop pronation). The left and right foot are rarely the same (yet we used the same foot orthotic designs under the left and right foot). There is substantial variation from person to person (which has to mean something for function, even if my interpretation of what I think it means is wrong). There are some heavy people that were easy to supinate and some were hard to supinate (and ditto for kids). There are relationships to some pathologies that are pretty consistent (but not related to other pathologies). The device consists of a fabric strap attached to the ground about there the cuboid is and then passes up around the medial side of the talonavicular joint to a pulley system, so that when the pulley has some force applied to it, it supinates the foot. 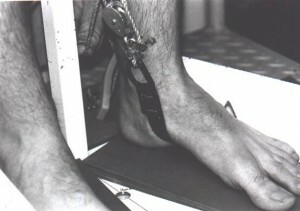 This is attached to a force gauge to give us a measure of the force to supinate the foot. We quickly confirmed the initial observations. A key observation in the early use of the device was the substantial variation in the force needed from person to person. Using our device this varied from as low as 60 Newtons to greater than 350 Newtons. At 60N, I can supinate the foot with my little finger on the clinical version of the test. At 350N, I need two fingers and two hands to supinate them. The mean value was around 140N. Its not hard to appreciate that there is likely to be significant differences in the way a foot might function if only 60N was needed to supinate it versus 350N. We reported on its reliability. Ian Griffiths built a different version of a device to measure the forces and he reported its reliability. Thought Experiment: Think about this: If I need two fingers and two hands to supinate a foot, how hard do the muscles that are supposed to supinate the foot need to work? How hard are the posterior tibial and calf muscles going to have to work in that foot? How much of a risk are they then at for pathology because of the loads that are going through the tendon? Why is there such a variability from person to person in their supination reistance force? You would assume that a heavier person would be harder to supinate and a lighter person would be easier, but our clinical experience did not fully support that. In an early experiment we reported that about one third of the variability in the force was explained by bodyweight, so yes body weight is a factor, but not a major factor. In that same study we also reported that about a third of the variability in the force was explained by the transverse plane position of the putative subtalar joint axis. This would make some sense as it has to do with lever arm variations to the joint axis. What does foot posture or alignment have to do with the force to supinate the foot? Our clinical experience was that there did not seem to be much of a relationship. Some very flat pronated feet were easy to supinate and some were hard. Some “normal” feet were hard to supinate. What we found was that the Foot Posture Index (a global measure of foot posture) explained about 12% of the variability in supination resistance; just the arch height only explained 7%; so yes posture or alignment of the foot is related, but very weakly to supination resistance. This could be one possible explanation as to why some people with very overpronated feet never get symptoms – they may have low supination resistance, so the load in the tissues is not high enough to become symptomatic. I talked about in this post how we found those with peroneal tendonitis had a mean supination resistance of only 91 Newtons; whereas the reference group was 138 Newtons. This could easily explain why the peroneal tendons needed to work so hard in these people and probably increase the risk for that injury. In those with posterior tibial tendon dysfunction, I found the mean supination resistance was 328N. If 328N was needed to supinate the foot, then imagine how hard the posterior tibial muscle is having to work. Multiple that work over the lifetime of the person, is it any wonder that they developed posterior tibial tendon dysfunction? One thing you do notice clinically when doing this test is that in those with a history of repeated unilateral lateral ankle sprains, that most of the time (not all of the time), that supination resistance tends to be lower on the side with the repeated ankle sprains. In the group I looked at, the side with the repeated ankle sprains only needed a mean of 81N to supinate. If its that low, is it any wonder that the ankle is easy to sprain? Next time you see someone with a history of repeated ankle sprains on one side, do the test and see what you find. Some criticisms of this test is that it is static. Of course it is; almost all clinical tests are static. 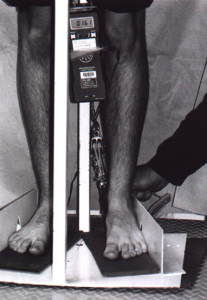 During dynamic function, the windlass mechanism is trying to supinate the foot; the muscles are trying to supinate the foot; and the external rotation of the limb coming from above is trying to supinate the foot – all this is going on, so the question is, what is the relationship between the static test and dynamic function? In this experiment we measured the supination resistance and then measured the pressure between the foot and a foot orthoses in the area where the supination resistance test is done. We found a correlation with an r value of 0.54, which I think is pretty impressive for a static test predicting dynamic function when you consider all that is going on dynamically. This one I don’t want to make a lot of noise or claims about as it was secondary data from a project that was for another purpose. But, what I looked at in the data was the supination resistance and symptom change at one month in a group of people with plantar fasciitis treated with soft foot orthotics. What I found was a very small negative, but statistically significant correlation between supination resistance and change in symptoms. What this means is that those with a lower supination resistance had a bigger improvement in symptoms (ie the negative correlation) and those with a higher supination resistance had a smaller improvement in symptoms. This makes intuitive sense as those with a high supination resistance would flatten soft orthotics and would probably get less of a clinical response. Do you know when you see someone with ‘overpronation’ related symptoms that is unilateral and you look at them standing and usually (but not always) the symptomatic side is more pronated? This experiment recruited 28 people with unilateral symptoms that could have been considered related to ‘overpronation’. Looking at the Foot Posture Index, yes the symptomatic side was more pronated in 15 of 24 (it was equal in 4 of them), but that still left 9 of 24 that the non-painful side was more pronated. Looking at the supination resistance, it was higher on the painful side in almost all of them (25 of 28); so the pronatory force (ie supination resistance) was more predictive of the painful side than the posture of the foot. A really simple experiment we did was to measure supination resistance with and without a 10mm heel raise. It was 14% lower with the heel raise. This implies that a typical running shoe with a 10mm drop, the muscles hypothetically don’t have to work as hard to supinate the foot (…maybe?). Do you know those people that wear a hole in the top cover of a foot orthotic or the insole of the running shoe on one side only and not the other side? Almost 100% of the time (there is always the occasional exception), the supination resistance is higher on the side that they wear out the insole quicker. This makes intuitive sense as the forces are higher on that side. I am so over the hard vs soft foot orthotic question. If supination resistance is high, you need something rigid. They will just flatten out anything less than rigid and possibly not get a therapeutic response. Conversely a soft orthotic will be fine for those with a lower supination resistance as it will provide more than enough force needed. A rigid very inverted foot orthotic in those people could potentailly increase the risk for an ankle sprain as the force provided is way beyond what that foot needs (assuming it even needs a foot orthotic). There are times in some people I would make foot orthotics out of steel if I could, as that is the magnitude of force that is needed. So its not about flexible or soft vs rigid – its about how much force that the foot needs and having design features in the foot orthotic (ie rigidity and medial rearfoot wedging) that match that hypothetical force. This concept could potentially go some way to explain why those with a “normal” foot develop ‘pronatory’ related patholgies. Even that normal looking foot can still have high forces associated with it. Conversely a very flat pronated foot could have low forces, so during gait when the heel starts to come off the ground the windlass mechanism, the muscles and the proximal external rotation work just fine with that foot. In the foot with high supination resistance the windlass mechanism, the muscles and the proximal external rotation are going to have to work a lot harder to do their job and may breakdown under those loads (assuming that they can even do their job!). Following on from that and all the issues about if a problem is coming from proximal (eg hip) or distal (eg foot) – its not either/or, they work in concert. Imagine this scenario: a whole lot of proximal control exercises and muscle strengthening is done to try and correct an issue – how effective is that going to be if the foot does not want to move (ie supination resistance is high)? If supination resistance is low, then that proximal control stuff should work just fine. This was the point I was getting at in the discussion of the purpose of a foot orthotic being to reduce that rearfoot inversion moment (ie when supination resistance is high), so that proximal control can work. Interestingly, I have yet to see a runner who has successfully been able to forefoot strike or get to barefoot or minimalism who has a high supination resistance. They just can’t seem to be able to do it successfully. The muscles are already having to work so hard to overcome the higher supination forces and if you add in the extra effort of those same muscles to get to the midfoot or forefoot, they just can’t do it as its just too hard. Supination resistance is not the only force that we can look at clinically; the force to get the windlass mechanism established is another one. Try this thought experiment: Imagine that supination resistance is high and the force to get the windlass mechanism established is high. How hard do you think the muscles are going to have to work to get the heel off the ground when walking (let alone running!)? How at risk are the tissues for injury with those high forces? Think of the opposite situation of a foot with low supination resistance and a low force to get the windlass mechanism established. How easy is it going to run up on the midfoot or forefoot in that situation? How low are the forces probably going through the tissues? How at risk are they possibly at for an overuse injury? What about running shoes? The prevailing paradigm of prescribing running shoes based on ‘pronation’ is obviously flawed and all the research allegedly supports that. 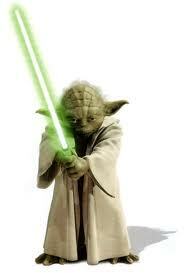 What about prescribing based on the force needed to supinate the foot? Think about it. Hopefully all that makes sense? There is an extraordinary amount of more research that is needed on this, especially prospective studies. I used to have poster of Yoda from Star Wars in my office and the students used to think I was nuts or had a screw loose until I explained that it was symbolic of ‘may the force be with you‘ … its all about the forces and not the motion. Kinematics does not hurt. Kinetics hurt. As always, I go where the evidence takes me until convinced otherwise and that evidence tells me that the concept of supination resistance is one possible solution to the paradox of the link between ‘overpronation’ and overuse injury. It explains a lot. 1. Interpret that how you wish and give as much weight as you like to these unpublished results. The primary reason that I have not submitted that work for peer review publication is simply: God put me on this earth to accomplish a certain number of things – right now I am so far behind, I will never die. Nice reflective practice. Do you think that self made termoldeable insole can adjust better the pressure of pronation and regulate the supination resistance? first time I write here, though I’ve been reading for a while. Brilliant thinking! Added a lot to my critical analysis, and possibly to those of other professionals. I wasn’t really aware of that concept (supination resistance) but it seems to make sense. Want to go a little deeper in learning about it, but I guess you summarized it pretty well. How about Leg Length difference, does it add to supination resistance? Here are a few points to further expand on the subject of the supination resistance test that I described in 1992 (Kirby KA, Green DR: Evaluation and Nonoperative Management of Pes Valgus, pp. 295-327, in DeValentine, S.(ed), Foot and Ankle Disorders in Children. Churchill-Livingstone, New York, 1992). First of all, we know that the subtalar joint (STJ) axis location is widely variable from one individual to another and even between the two feet of the same individual. The STJ axis spatial location seems to be determined mostly by the relative position of the head and neck of the talus (which is the anterior exit point of the STJ axis) relative to the rest of the foot. A preliminary radiographic study performed by Dr. Simon Spooner and I showed that the STJ axis tracked the talar head and neck nearly perfectly in pronation and supination (Spooner SK, Kirby KA: The subtalar joint axis locator: A preliminary report. JAPMA, 96:212-219, 2006). As the STJ axis becomes more medially deviated, ground reaction force (GRF) will have a shortened supination moment arm and will also have a lengthened pronation moment arm relative to the STJ axis by its mechanical actions on the plantar foot. As the STJ axis becomes more laterally deviated, ground reaction force (GRF) will have a lengthened supination moment arm and will also have a shortened pronation moment arm relative to the STJ axis. In effect, this change in STJ axis spatial location relative to the plantar foot will have significant effects on the prevailing pronation and supination moments acting across the STJ axis during any and all weightbearing activities for the individual (Kirby KA: Methods for determination of positional variations in the subtalar joint axis. JAPMA, 77: 228-234, 1987; Kirby KA: Rotational equilibrium across the subtalar joint axis. JAPMA, 79: 1-14, 1989; Kirby KA: Subtalar joint axis location and rotational equilibrium theory of foot function. JAPMA, 91:465-488, 2001) . Abnormal STJ axis location will also significantly affect the internal forces/stresses acting on the structural components of the foot and/or lower extremity due to the changes in external and internal moments which must be present across the STJ in order to achieve translational and rotational equilibrium with abnormal STJ axis spatial locations during standing and other weightbearing activities. As a result, our mechanical treatments (e.g. foot orthoses, shoes, braces) need to take into account these alterations in STJ axis location in order to achieve better treatment successes for our patients. This is why the idea of directing treatment toward the anatomical location of abnormal tissue stresses will be the key to better treatment outcomes in the future for foot-health care and sports injury specialists (Fuller EA, Kirby KA: Subtalar joint equilibrium and tissue stress approach to biomechanical therapy of the foot and lower extremity. In Albert SF, Curran SA (eds): Biomechanics of the Lower Extremity: Theory and Practice, Volume 1. Bipedmed, LLC, Denver, 2013, pp. 205-264). The supination resistance test is one method by which the clinician may “feel” the internal forces and internal moments acting within their patient’s foot which may hinder or prevent normal supination of the foot during weightbearing activities. In addition, the supination resistance test gives the clinician a good benchmark as to the magnitude of external force that will be required from a foot orthosis to cause supination of the STJ during weightbearing activities. As Craig stated, it can be a very helpful test in not only understanding the mechanical etiology of various foot and lower extremity pathologies but also may be valuable in better directing mechanically-based treatments of the foot and lower extremity. The bottom line is this: the key for success in treating foot and lower extremity injuries is to focus on kinetics, and not focus solely on kinematics. Awesome stuff Craig. It has opened my eye to explaining a lot of what we don’t understand. Should those with high supination resistance avoid zero drop running shoes? So based on that it is hypothetical and plausible that a 10mm drop shoe is going to be better than a zero drop shoe if supination resistance is high; as the 10mm drop will hypothetically and theoretically lower the forces by 14% (on average). I’ve not yet poured through the back links to this page to read further about supination resistance, so feel free to point me in the specific direction, but the recurring question that comes into my head is about patient assistance/resistance during the test. Have you found patients look down to watch you’re doing (which shifts load on the foot)? Have you found them attempt to help you when you perform the test (i.e. actively supinate)? Have you found them resist you? Yes they do try and help, but with almost all you can get them to relax and not have problems. Occasionally someone doesn’t …. and there is not a lot can be done about that! Bodyweight explains about a third of it, so theoretically you can change that. STJ axis position explain about a third (ie it lever arms); the ability to influence that is theoretically limited as it due to anatomical orientations …. but I do think that mobilizations and/or manipulation of the subtalar joints might influence it. Foot orthotics affect it by the structures not have to work so hard to over come it. I do not think that muscle strength affects it; supination resistance will be the same regardless of muscle strength; BUT, if the muscles are stronger, then it will be easier for the muscles to overcome it, whatever it is. As for the structures affected, if it high then the post tib muscles, soleus etc involved in supinating the foot (stop the foot pronating) have to work harder –> increased load. If supination resistance is low, then the peroneal muscles have to work harder –> increased load on them. Also if its high, I assume it harder to “get the heel öff the ground”, so teh structures involved in that process have to work harder –> load in tissues.